In a letter, Mary Cassatt describes working on Little Girl in a Blue Armchair (1878) with Edward Degas. An X-ray of the painting reveals brush strokes unlike Cassatt's regular strokes. It's possible that Cassatt's use of unconventional materials inspired Degas' textured surface on Portrait after a Costume Ball (1879). In At the Theater, Cassatt incorporates metallic paint with gouache and pastel. Degas frequently painted and sketched Cassatt. Above, he captures her at the Louvre, in 1879-1880. In her novel I Always Loved You, author Robin Oliveira imagines a passionate scene between Edgar Degas — a French artist known for his paintings of dancers — and Mary Cassatt — an American painter known for her scenes of family life. The kiss in the novel is pure fiction, but then again, "nobody knows what goes on in their neighbor's house, let alone what happened between two artists 130 years ago," Oliveira says. A new exhibition at the National Gallery of Art in Washington, D.C., explores the tumultuous, passionate, artistic relationship between the two artists. "In many ways, [it] is a romance of two like minds who admired one another greatly, and who I believe completely relied on one another for artistic and emotional help," Oliveira says. "Their relationship is a sort of an elevated, intellectual love affair that tied them to one another for the rest of their lives after they met." They left behind no diaries, no letters. National Gallery curator Kimberly A. Jones says it was a passionate but platonic aesthetic attraction. "There's no indication that there was anything romantic between the two of them," Jones says. So what was the relationship between this American in Paris, and a Frenchman, 10 years her senior, who was known and respected in artistic circles? "It was all about the art, and that kind of laser focus and 100 percent dedication to the art that they really shared," Jones says. They met in 1877. At 33, Cassatt was studying painting in Paris. At 43, Degas' work was on view around town. "Even before she actually met him she recounts how she had seen one of his pastels in a storefront window and she pressed her nose up against it and was just dazzled by what he was able to do," Jones says. "She knew his art and was thinking this is the direction I should be going in. So he really did change her path." Oliveira — who did a tremendous amount of research for her novel — says before the Degas dazzle, Cassatt had been trying to master a more traditional approach. "He helped her switch from the academic style of painting that she had been trying to learn — which was sort of the standard across Paris — and encouraged her along into the impressionist style, the impressionist brush stroke, the use of color and light. The subject matter changed." Neither Degas nor Cassatt liked the term "impressionism"; to them it implied carelessness, haste. They called themselves "independents" and labored over their work. A year after meeting Degas, Cassatt made a painting that was a real break in her style. Little Girl in a Blue Armchair is full of Degas' influence. First of all, he brought the girl to Cassatt — she was the child of his friends. In a pretty dress, she sits slumped in a chair, hand behind her head and legs spread apart. She looks bored, exhausted and not at all dainty or proper. Other big blue chairs and a sofa are in the room — "like bumper cars," Jones says. A window in the corner may show Degas' direct influence. In a letter written long after she made the work, Cassatt told her dealer that Degas came into her studio and worked on the painting with her. Looking for evidence, National Gallery conservator Ann Hoenigswald used X-rays, infrared imaging and magnification to study a diagonal — unusual in a Cassatt background — that builds across the canvas from that rear corner window. "We looked at it, and indeed the strokes were a little bit different. They were these sharp, small, quick strokes that we weren't seeing anywhere else," Hoenigswald says. The brushwork of Degas, perhaps. 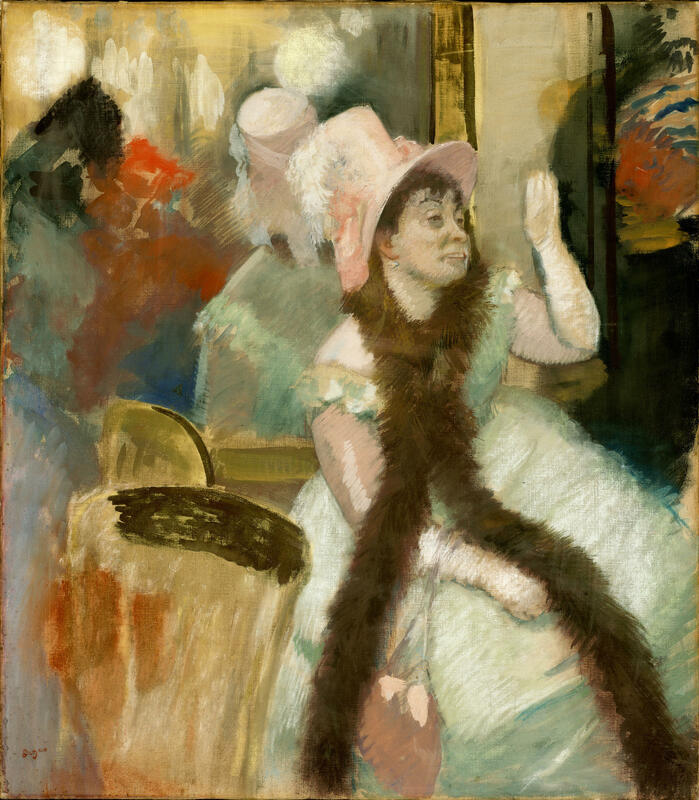 Cassatt's influence on Degas can be seen in a painting with an unusual mixture of media — pastels, oils and metallic paint. Cassatt was the first to use metallic paint on canvas; ordinarily it was for decorating crafts. Jones believes Degas saw Cassatt's metallics and decided to try it himself. They worked side by side at times, went to exhibitions together, and Degas often drew and painted Cassatt. A frequent image: Cassatt at the Louvre, painted from the rear — big hat, smart jacket, long skirt, tiny waist, her right hand and arm leaning on an umbrella as if it were a walking stick. "You have this wonderful juxtaposition of the female curves of her body," Jones says. "The way he has her leaning plays off the swell of her hips and her waist. But you have that powerful arm — and it's this perfect balance of elegance and strength." Confident and in control, Cassatt owns the space. Degas captured that image of Cassatt in pencil, pastel, prints and paint. Jones says Degas also captured Cassatt in the art he bought. "He owned more works by Cassatt than [by] any other contemporary artist," she says. "More than Pissarro, Manet, Gauguin." They remained friends all their lives, although they went their separate artistic ways in later years. Their interests and styles changed. Degas' eyesight failed, as did Cassatt's. But the intensity of their relationship — the early obsessions — shaped each of them, early on. Here in Washington a new e new exhibition at the National Gallery of Art explores how two artists, icons if Impressionism, made impressions on each other. One was a French painter known for his ballerinas, the other an American known for her scenes of family life. The relationship between Edgar Degas and Mary Cassatt bloomed in Paris and this morning we learn more about the true nature of that relationship. Here's NPR Special Correspondent Susan Stamberg. SUSAN STAMBERG, BYLINE: More than half-way through her Novel about Degas and Cassatt, author Robin Oliveira writes: Her fingertips grazed his cheek as he kissed her, they sank into one another. Well, it's about time! They waited 188 pages. Fact? Fiction? Novelist Oliveira is a bit coy. ORBIN OLIVEIRA: Nobody knows what goes on in their neighbor's house, let alone between two artists 130 years ago. STAMBERG: And it was a powerful relationship. Tumultuous. Full of passion. But physical? OLIVEIRA: This is their romance in the sense that in many ways, it is a romance of two like minds who admired one another greatly and who I believe completely relied on one another for artistic and emotional help. And their relationship is a sort of an elevated, intellectual love affair that tied them to one another for the rest of their lives after they met. STAMBERG: Still, in "I Always Loved You" the novelist imagines a kiss. But, with no diaries or letters to consult for evidence, National Gallery curator Kimberly A. Jones thinks platonic. A passionate aesthetic attraction. KIMBERLY JONES: That is certainly my belief. I mean, there's no indication there was anything romantic between the two of them. STAMBERG: OK. Time to give People magazine back to the dentist. What was the relationship between this American in Paris, and a Frenchman, 10 years her senior, known and respected, then, mostly in artistic circles? JONES: It was all about the art, and that kind of laser focus and 100 percent dedication to art that they really shared. STAMBERG: They met in 1877. At 33, Cassatt was studying painting in Paris. At 43, Degas' work was on view around town. JONES: He was already in her mind's eye even before she actually met him. She recounts how she had seen one of his pastels in a storefront window and she pressed her nose up against it and was just dazzled by what he was able to do. She knew his art and was thinking this is the direction I should be going in. So he really did change her path. STAMBERG: Author Robin Oliveira - apart from the smooch, her novel is based on tons of research - says before the Degas dazzle, Cassatt had been trying to master a more traditional approach. OLIVEIRA: He helped her switch from the academic style of painting that she was trying to learn - which was sort of the standard across Paris - and encouraged her along into the Impressionist style; the Impressionist brush stroke, the use of color and light, the subject matter change. STAMBERG: Neither Degas nor Cassatt liked the term "Impressionism." To them it implied carelessness, haste. They called themselves Independents, and labored over their work - although it looks so fresh. A year after meeting Degas, Cassatt made a painting that was, for her, a real break in style. "Little Girl in a Blue Armchair" is full of Degas' influence. First of all, he brought the girl to Cassatt - she was the child of his friends. She sits with a hand behind her head, and her legs spread apart. OLIVEIRA: It's actually a very modern pose. The little girl is slumped down in a blue armed chair in a very pretty dress. JONES: She is reclining back in the chair. JONES: There looking quite exhausted after probably a day of running around and playing. STAMBERG: What you see in her face is exhaustion. What I see is could we get this over please, I'm so tired of sitting here. JONES: This is definitely a very bored little girl. You know, she's tired. This is not a dainty, prim, little proper girl. STAMBERG: There are other big blue chairs, and a sofa in the room, like bumper cars, Jones says. 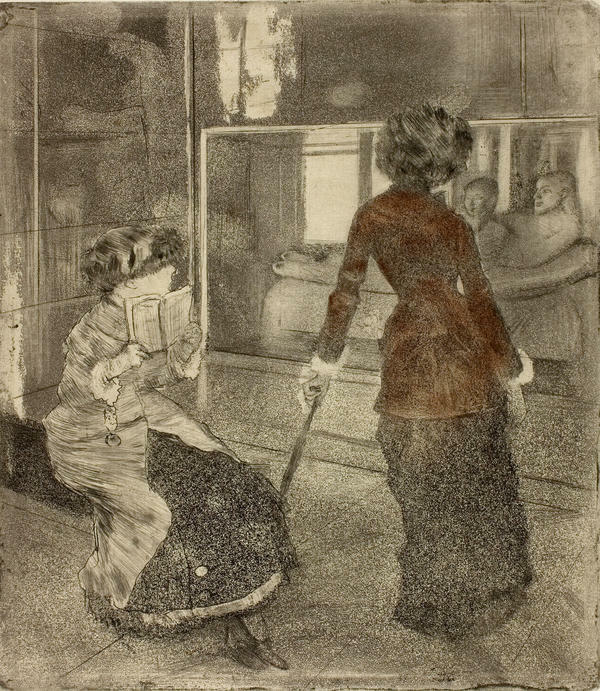 In the rear left-hand corner, a window may show Degas' direct influence. National Gallery conservator Ann Hoenigswald was intrigued by a letter Cassatt sent to her art dealer. ANN HOENIGSWALD: She says that Degas came into her studio and actually worked on the painting. STAMBERG: Hoenigswald used x-rays, infrared imaging and magnification to study a diagonal - unusual in a Cassatt background - that builds across the canvas from that rear corner window. HOENIGSWALD: And we looked at it and indeed the strokes were a little bit different. They were these sharp small quick strokes that we weren't seeing anywhere else. STAMBERG: Ta da! The brushwork of Degas, perhaps. And, both conservator and curator say Cassatt influenced him. Degas has an unusual mixture of media in one picture - pastels, oil and metallic paint. Cassatt used metallic paint on canvas first. Ordinarily it was for decorating crafts. Curator Jones believes Degas saw Cassatt's metallics, and decided to try it himself. They worked side by side at times. Went to exhibitions together. 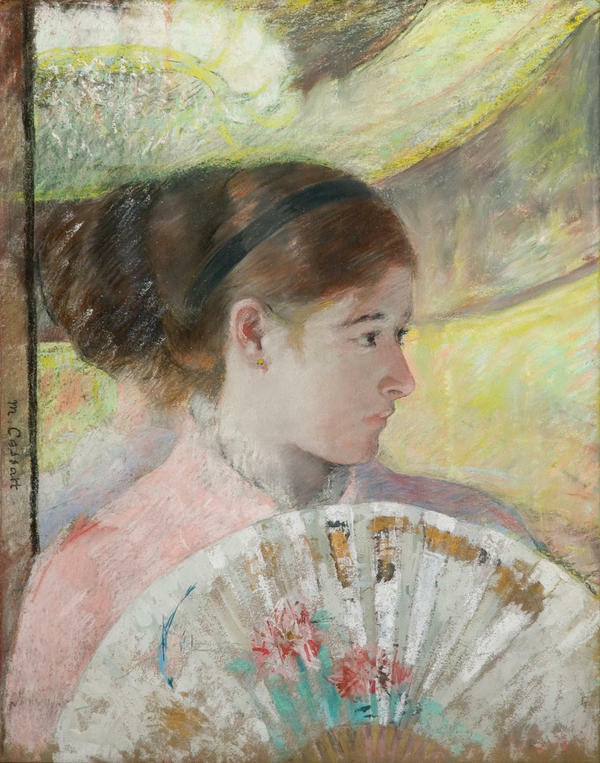 Degas drew and painted Cassatt often. A frequent image - Cassatt at the Louvre, painted from the rear - big hat, smart jacket, long skirt, tiny waist, her right hand and arm leaning on an umbrella as if it were a walking stick. JONES: And so you have this wonderful juxtaposition of the feminine curves of her body, the way he has her leaning plays off the swell of her hips and, you know, her waist. But you have that powerful arm. And it's a perfect balance of elegance and strength. STAMBERG: She looks to me extremely confident and rather judgmental. That is, she's looking at these paintings and thinking, mmm, that one's OK. Ummm, not so good. Mmm, OK.
JONES: Yes. It's a very - I mean, this is a woman, she is in control. Mary Cassatt owns that spaces. STAMBERG: Degas worked that image of Cassatt in pencil, pastel, prints, and paint. And at the National Gallery - the show runs there till early October - curator Kimberly Jones says Degas also captured Cassatt in the art he bought. JONES: He owned more works by Cassat than by any other artist. More than Pissaro, Manet, Gauguin. STAMBERG: They remained friends all their lives, although they went their separate artistic ways in later years. Their interests and styles changed. Degas' eyesight failed. So Did Cassatt's. But the intensity of their relationship - the early obsessions - shaped each of theme. In Washington, I'm Susan Stamberg, NPR News. INSKEEP: It's MORNING EDITION from NPR News. I'm Steve Inskeep. And I'm Renee Montagne. Transcript provided by NPR, Copyright NPR.